Hey there Peeps! Ginny here and I'm excited to be sharing my project for the BoBunny - 3L Blog Hop. I chose to create a cover for my weekly menu planner . With a busy household and active kiddos we really need to plan our dinners ahead to avoid chaos and too much going out for meals. I found this awesome tablet with a week on each page so I can get the schedule down before I shop. Lot's of paper patterns here all piled up in one big happy arrangement topped off with a little dimensional banner and layered chipboard sticker. To give the banner dimension and to adhere it to the cover I used the 3L 3D Foam Spacers. Love these! This package has 2 sheets with big and little spacers so I didn't have to clip them to fit, Yay!!! Emmy here sharing my project featuring. BoBunny Felicity collection and some of my favorite 3L adhesives. 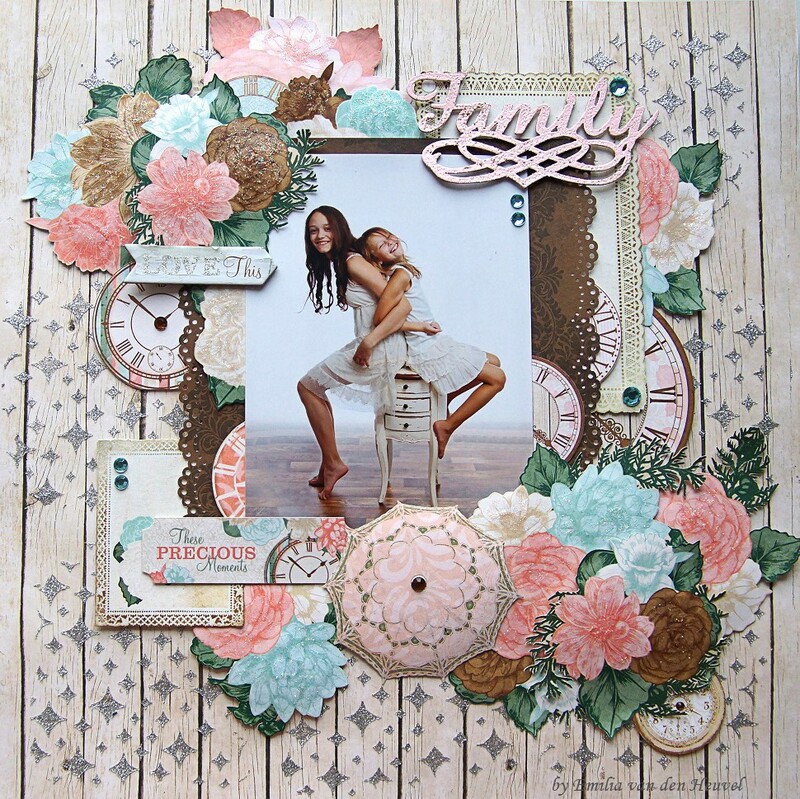 To create this layout I used pattern papers, stickers and layered chipboard from BoBunny's Felcity collection. I altered the background paper using a stickable stencil and silver glitter paste. Then, I fussy cut the flowers and the cute parasols from different pattern papers and from the 6x6 Paper Pad matching the collection. As a final touch I added glitter paste on some of the blossoms and rhinestones. The gorgeous 3D effect on my page is all because of the fantastic 3D foam products from 3L Adhesives, making everything really POP! Very nice. Good work from de DT girls! I miss the monthly challenges (and there was no winner for the last one in july... sad). Love the retro design and colors. Two great projects! Can't miss with Bo Bunny and 3L! The cover of the meal planner is great. Love the retro colors and designs. The apron is a fun touch. Lovely projects. The green on the first card is the same green in my great grandmothers kitchen. Just delightful! That menu planner is genius! Such a stunning layout! So many details! Great idea for the menu planner and will look awesome in the kitchen! The layout is just gorgeous! All the fussy cutting and layering is amazing! Thanks for sharing! Wow! Both projects are really beautiful!!! Love the amazing colors and all the details!!! I 💛💙💚 that menu planner! What fabulous layers on the fun meal planner and oh-so-pretty sparkly flowers on the lovely layout! Love the layout - nice arrangement of elements and the glitter paste is so pretty. I especially am loving the menu planner!! Great ideas to add colour in my kitchen. These certainly will not be put away in a cupboard. Love all of it. Oh how sweet! I adore Ginny's super cute and functional menu planner!!! Totally fab!!! And Emmy's layout is so super beautiful!!! Thank you for both amazing and inspiring projects today, ladies!! Love the colorful menu planner and the beautiful layout. What fantastic ideas. Am loving Ginny's Kiss the Cook weekly dinner planner! What a terrific little book, idea and collection! And Emmy's layout is so sweet with all the layers, glitter paste, and chipboard/stickers! I have a Pinterest board just for Bo Bunny and am pinning these to find the materials to make later!! Thank you for all of your beautiful collections and inspiration! Awesome planner and layout! Gorgeous colors and details on both of these lovely projects!